Avocados, lemon, sour cream, onion, pico de gallo, garlic, salt—sounds like guacamole time! At its most basic, everyone knows how to make guacamole, and more importantly, everyone has his or her own way of making it. Your mom has her secrets, your barber has his and you have your own—and you intend to keep it that way. Whatever your special ingredient, whatever your secret method, there is always room for improvement where guacamole is concerned—unless you come to Benny’s Tacos where the guacamole is made to perfection. Our delectable garlic-infused chicken may distract you from experiencing the rest of our menu, but our guacamole in particular is not to be missed. The perfect blend of sharpness from the onion, the creamy avocado that still maintains its chunkiness, the sweet lemon, the dash of salt… You won’t soon forget the taste of Benny’s Tacos guacamole. You know what pairs wonderfully with guacamole? How about tangy chicken, crisp, freshly made tortilla chips, snugly wrapped burritos, and all the rest of the food at Benny’s Tacos? There are times in every guacamole-lover’s life in which your batch of guacamole is less than perfectly tantalizing. We don’t have those days at Benny’s Tacos. Whenever you’re craving that perfect taste of guacamole, we’re only one phone call away. The best part of our guacamole? None of it is artificial. Between the avocados, tomatoes, cilantro and the rest of our guacamole ingredients, the entire process is crafted with freshness in mind. We know our customers come to Benny’s Tacos expecting to receive warm, freshly made tortillas, crisp, crunchy tortilla chips, and fresh, creamy and chunky guacamole, so that is what we make. And we make it better than anyone else in town. In Los Angeles there are Mexican food vendors on every corner, but doing Mexican food correctly is becoming rare. Benny’s Tacos takes you to a place of utter contentment, producing food that ingrains itself in your taste buds, forcing you to come back for round two. If you don’t believe us, just come by. Our guacamole is made fresh daily and you won’t soon forget the experience. Wanderlust: a strong desire for or impulse to wander or travel and explore the world. When it comes to wanderlust, I’ve been afflicted for years and it doesn’t seem like I’ll be cured any time soon. It’s the one condition that I not only enjoy, but actively cultivate. I’ve traveled and lived in places from time to time but California always ropes me back in. California is a powerful entity just as much as it is a physical location. Over time it has marketed itself in such a way that the rest of the world knows what it encompasses. Or at least, they think they do. In every place there are subtle nuances ingrained into local culture, and California is no exception. As a California native, I’ve taken many of these nuances for granted, not realizing just how much I would miss them if they were suddenly omitted from my life. Of all the California-centric degrees of culture, Mexican food remains a ubiquitous staple; the further east I travel, the less likely it becomes that I’ll find a delicious al pastor taco. The Golden State has even adopted and modified certain dishes to create phenomenal food, among them mission burritos and carne asada fries, which are virtually unheard of when you leave California behind. It’s very difficult to fathom living in a place where Mexican food isn’t pervasive. I’ve had stints in other countries that lack Mexican food and I was never really affected, either because my time away from California wasn’t long enough, or because I knew my separation would soon be over. Growing up with Hispanic culture all around me might not have shaped me as a person, but it definitely embedded itself into my subconscious perspective. I don’t think twice about reading Spanish ads on the street or overhearing a conversation in Spanish. As an extension of my Hispanic culture, though I acknowledge Mexican food to be “ethnic,” it is hardly “exotic” as it’s just as common, if not more so, as “continental” food. Local hole-in-the-wall shops are known and favored in their communities over popular chain restaurants, with good reason. Local restaurants can afford to dedicate the time to make quality food. Benny’s Tacos is one such local, quality producer of Mexican food. Benny’s Tacos is acknowledged as a valued eatery with roots in the city of Los Angeles, a city dedicated to the production of authentic Mexican food. They have used California’s love for Mexican food and created a foundation for success in the Mexican food community. Hulu loves Benny’s Tacos’ Catering! What’s the best part of any company gathering? You got it: the catering. A company gathering with good food can transform what may feel like an obligatory celebration into a delectable reprieve from keyboards, phone calls, and business reports; excellent food transforms a day at work into a day relaxing with friends. That’s why, when the Santa Monica division of Hulu needed its company event catered, it called Benny’s Tacos. Hulu, a successful subscription and internet streaming company, knows that Benny’s Tacos isn’t just good food, it’s excellent food crafted with particular care to deliver the homemade flavor Benny’s Tacos is known for. After sampling Benny’s Tacos food and catering at a past event, Hulu requested the service of Benny’s Tacos yet again. The perfect location between Santa Monica, Culver City, and Venice, Benny’s Tacos catered the event, setting up the food and serving the 250 guests with the same friendly and efficient customer service that can always be expected from Benny’s Tacos. Specifically, and with stomach-grumbling resolve, the Hulu team requested Benny’s Tacos’ hearty Angus beef tacos, flavorful homemade green and red salsa, and cheesy chicken red sauce quesadillas served with farm fresh vegetables. Even as returning customers, the Hulu team was impressed with the service of the Benny’s Tacos’ catering team. Let Our Catering Team Take Care of Your Next Event! Benny’s Tacos is food crafted to satisfy, but don’t let your satisfaction end once you leave the premises. Benny’s Tacos offers catering for events big and small. If a big-time company like Hulu can appreciate our tacos, quesadillas, and salsa, so can you! Whether you have a baby shower, birthday party, company gathering, or just a casual party, let Benny’s Tacos take your revelry up a notch. We’ve catered for Hulu, Yelp, Google and Sony—we can cater for you, too! If you live or work in Santa Monica, Venice, Culver City or elsewhere on the Westside, Benny’s Tacos is available to cater your event. Check out our catering page and make an appointment today! In our society, chicken is often viewed as boring and commonplace. When Mom gets home late and doesn’t know what to cook for dinner, she whips up some quick pasta with chicken. We eat it in our sandwiches, our salads, our soups, and hot off the grill. From a young age, we grow accustomed to chicken as an easy, simple, plain meal or addition to a meal. And the worst part of it all is that the chicken we eat usually tastes the same—and we expect it to taste the same because it’s considered boring. So wouldn’t it be fun if chicken were exciting again? What if we told you that Benny’s Tacos has put the fun back in chicken? Not only do we cook our chicken rotisserie-style right before your eyes, but it tastes like none you’ve ever had before. This is not the same stuff Mom whips up for dinner: the chicken at Benny’s Tacos is marinated in a delicious combination of herbs and spices, but most noticeable is the tantalizing taste of garlic beneath the skin. You can taste the spritz of lemon, and the massage of garlic that went in to making our chicken glisteningly delicious. A sharp palate will discern dozens of other spices blended into the marinade, but even those diners without the ability to pinpoint every herb will know that something is different about our chicken. Before opening Benny’s Tacos, our owners and chefs traveled around the world to learn how to make the best tacos. On the way, they discovered the recipe for an unforgettable chicken experience. You’ll be surprised just how much you enjoy eating our mouth-watering chicken, and you’ll be even more surprised to find you can’t forget it when the experience is over. Our phenomenal recipe will have you planning a return trip before you leave the restaurant. Add in a few fresh, house-made tortillas and a serving of our chunky, tasty guacamole and you’ll be a Benny’s Tacos fan for life. The point of a party or event is to have fun, and that doesn’t change just because you are the host. There are many aspects of throwing a successful party or event, but arguably one of the most challenging facets of event-planning is the food. If you choose to cook all the food yourself, you may be in for several grueling days of putting your inner chef to work, but remember: there are easier, less stressful options. Namely: catering. If you and your guests enjoy succulent, flavorful rotisserie chicken and tangy and savory authentic Mexican food, then you need to call Benny’s Tacos for reliable catering. As a business, our goal is to please customers with tasty and authentically flavorful meals. That’s why there are few compliments that are as satisfying to a business as receiving a five-star rating on Yelp from a customer. That Yelp review means we executed our jobs so efficiently, that customer just had to shout his or her satisfaction from the proverbial rooftop that is social media. One compliment we do find more rewarding? When Yelp itself comes to us for its catering needs. 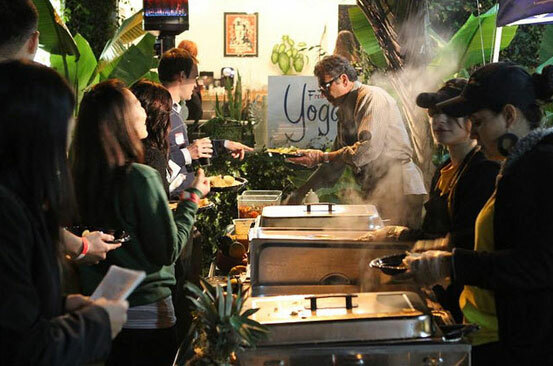 And Yelp was in good company: not only has Yelp sought the reliable catering services of Benny’s Tacos for its business events, but so too have Hulu Cable, Sony, Fred Segal, and Google. Those are some big names! Some of these events have even had as many as 300 people eating from a full-scale buffet decked out with the mouthwatering food made by Benny’s Tacos! If we can cater for Hulu, Yelp, and Google, we can certainly cater for your event. The reliable catering service offered by Benny’s Tacos is staffed and coordinated by professionals. Set-up is included and delivery within a 5-mile radius is free. If you have longer than 24-hours before the event you are planning, ensure your event is a hit and call Benny’s Tacos for reliable catering today.